How much ram to dedicate? Vanilla 1GB is usually enough unless your having a large single player and/or playing 1.13 or 1.13.x world in which case bumping it up to 1 or so GBs may help. For 1.13 branch you may need to double these due to the performance flaws, 1.14 should be back "on track" to performance to features ratio. 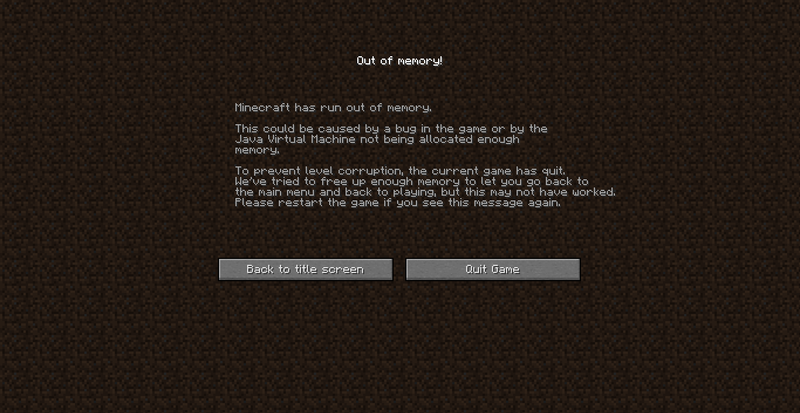 Very heavily modded packs will not be possible with just 4GB of RAM to give to Minecraft. You need a minimum of 5GB, and that's on the lowest settings possible. That's on the very light end of the heavy category, the most expensive pack I've seen had a recommended minimum of 7GB with a recommendation of 10GB for smoothest play, but most are in the 6-8 range. I've found pure-vanilla 1.13 to be much smoother than 1.12, but with 4GB allocated to it I was having all sorts of sync issues that made it completely unplayable. It was quite weird, because other than the syncing Minecraft wasn't at all acting like it was lagging (no stuttering or choppy camara movement, I always had 60ish FPS). I can't even begin to comprehend why modpacks need so much memory and for what reason; I've added over 300 new blocks alone, plus hundreds of other features, to TMCW yet it only needs around 100 MB, and I could add tens of thousands more and stay within an allocation limit of 512 MB, much less 1 GB (each 16x16 texture is 1 KB uncompressed; even 1024 textures is only 1 MB of texture memory, with the code and data for each block being another KB or so, if even that since I use metadata very heavily and blocks like stairs and walls take their textures from their parent blocks; for example, I added 14 new types of walls with just 3 KB of new code and no new textures and have only added around 20 actual new blocks when going by unique block IDs; one of these alone has 104 variants and 60 textures). Even for older versions I've seen claims that they need a minimum of 500 MB to just start up, as mentioned here (their statement regarding the texture changes in 1.5 are nonsensical since the game always used a single texture atlas in memory, it just loads separate textures now. Also, the size of the Minecraft jar for 1.6.4 is actually smaller than the one for 1.4.7, indicating that Mojang actually cleaned up the code between those versions; since 1.8 it has grown at a rate far exceeding what new features can possibly account for; even so, the resource usage of vanilla has increased at a far slower rate than a modpack that adds the equivalent number of features, when I last ran it 1.13 allocated about 500 MB out of 1 GB maximum). Generally, the benefits of being able to address larger amounts of memory come with a small performance loss in 64-bit VMs versus running the same application on a 32-bit VM. This is due to the fact that every native pointer in the system takes up 8 bytes instead of 4. The loading of this extra data has an impact on memory usage which translates to slightly slower execution depending on how many pointers get loaded during the execution of your Java program. Also, the single biggest source of memory usage in vanilla is loaded chunks; for example, with a view distance of 10 there are 1507 chunks loaded, including the spawn chunks and chunks around the player (the game loads a 25x25 chunk area around spawn, plus a 21x21 chunk area around the player at a view distance of 10, which is loaded on both the server and client), which takes up about 74 MB of memory if the average loaded chunk height is 5 sections (y=80 or lower). This is about 77% of the memory usage in the example I gave above (this only applies to versions before 1.8, where each section has 4096 bytes of block IDs and 2048 bytes each for metadata, block light, and sky light, 10240 total; data like entities and tile entities are generally minor). Newer versions also account for this by limiting render distance to 16 chunks unless 2 GB or more is allocated; 32 chunks requires about 4 times more memory than 16 so 512 MB should be enough for 16 (newer versions do need considerably more overhead for non-chunk data though). For comparison, the texture atlas used by 1.13 is 1024x512 pixels and requires 2 MB for the default resolution, while if you use a 512x texture pack then the memory requirements will be 1024 times higher, or 2 GB. Because of this variance the best way to see how much memory is needed is to check the amount that is actually being allocated (e.g. 220 MB in the example above), adding some margin to it (I normally allocate 512 MB when playing and around 350 MB has been allocated by the end of a 3-4 hour play session. If you find it hitting 100%, and used memory also frequently reaches 100%, particularly if lag spikes occur when memory usage drops, then you should allocate more). Part of it is just really bad coding, which is probably just due to how widespread and easy java modding is. Everyone and their mother could do it, but most were likely self-taught as hobbyist coders and maybe don't know all the tricks and proper ways to do stuff (which means they're happy when they get something working even though they might not fully understand the why of it or how to do it better). This means they leave all sorts of errors in the code that don't do anything apparent but which could cause issues later (the average modpack has something like 200 errors and maybe a handful of fatals). The rest of it is just sky's-the-limit content addition. 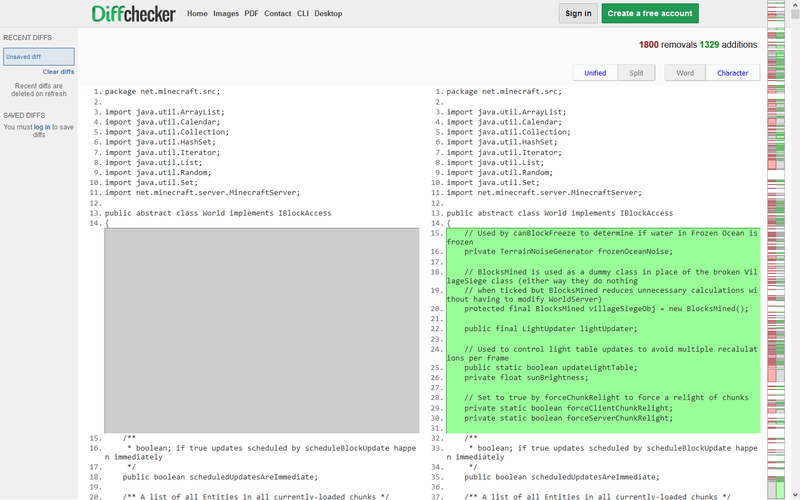 Modpack authors seem to be trending towards larger and larger kitchen-sink type of packs nowadays. Expert mode packs also tinker with the recipes, so you might be forced to use more of a mod that isn't coded so well. Another issue is that mods allow a greater range of automation, so eventually there will just be more stuff happening than in vanilla (basically, with only a handful of exceptions, if it's in the game it can be automated). Finally, in vanilla the mobs from an AI perspective are really, really dumb and don't really do much. In modded, they can potentially do everything the player can. Even with "bad coding" as you mentioned in a later post, there is absolutely no way that a modpack uses that much memory. You would have to have an insane amount of mods. Like, an INSANE amount of mods. I'm no expert though. What do you consider insane? My computer has win 8.1 with 8GB ram installed and an AMD 64 processor clocked at 3.4GHz. I can easily run a modpack that has up to 200 mods, and if the modpack is exceptionally well-put-together and optimized I can probably attempt 225 mods with little enough issues that I still consider it playable (but not ideal). I only give 4GB to Minecraft, because I've found that giving 5GB kills computer performance enough to make Minecraft unplayable. Not so much with the lighter end of things, but I have to have optifine installed and set to fast math, fast render, and terrain animations turned off, otherwise no matter what other visual settings I rachet down to absolute minimum I still only get between 5-10 fps and very choppy play. Middle-of-the-road modpacks have between 100 and 200 mods. Extra large packs range from 200 up to 300+, and light packs have less than 100. What exactly is the definition of a mod? I can claim that TMCW has more than 500 mods and I'd be correct if you counted every separate change/block/item/biome/mob (I have around 300 listed in the changelog for TMCWv5, which is in addition to previous updates, which also doesn't count every single variant, just the base variants; e.g. there are 104 variants of stalagmites/stalactites but only 14 are obtainable as an item. Each ore has 9 variants (10 for gold) but I only listed it as two new features; ores blending in with biome-specific underground blocks, and gold ore in the Nether). On the other hand, it is packaged and described as a single mod; however, this means that a single mod can add as much content as hundreds of small mods so just saying that a modpack has 200 mods doesn't really mean that much (from what I've seen many of the "mods" are also core libraries that other mods depend on; back when I used Forge it even included itself, FML, and MCP as 3 mods with nothing else included but most people wouldn't include them). Either way, the memory usage seems extreme based on my own experiences with how much code/textures are needed to implement something; even the most complex class in TMCWv5, a rewrite of the vanilla RenderBlocks class, is 675 KB (the original class was 404 KB so this is an increase of 271 KB), followed by 270 KB for my custom cave generator; the latter allocates about 7.5 KB of memory for various data structures. Overall, I've added about half as much new code as exists in all of vanilla 1.6.4, based on the size difference between the original MCP source and with my modifications and additions (even vanilla classes which did not change much in size have been extensively modified). This is still less than the size difference between 1.6.4 and 1.8 (4.5 vs 7.4 MB, with 1.8.9 at 8.1 MB - the difference between just 1.8 and 1.8.9 is about the size of 1.6.4 + TMCWv4 + Optifine vs 1.6.4 alone - and that was just from patches). As mentioned before, each 16x16 texture is 1 KB uncompressed, so you could literally add a million new textures and only get a 1 GB increase (unless you use HD textures; a 512x pack requires 2 GB of memory just for itself as of 1.13 but it seems unlikely that many mods would use such texture sizes). There's many other examples of wasteful memory usage by vanilla (in this case, actually being used by something); for example, the leaf decay algorithm uses a 32768 element int array (128 KB) when it only needs to be a 4096 element byte array (4 KB, which could actually be even smaller, but powers of 2 (16x16x16 vs 9x9x9 for a 4 block max distance) make it faster to calculate the array index (I measured the time it took in-game for various changes to the overall algorithm and used the fastest one, which is 3 times faster than vanilla). I also made this array be shared among all leaf blocks, while vanilla requires each block to have its own array; since I have 3 leaf blocks (12 variants) so far that's 380 KB of memory saved, and 124 KB less than vanilla 1.6.4 and 252 KB less than vanilla 1.7+).